We've taken a bit of time off and are back now with the latest OpenScientist Book-of-the-Month club entry, "Benjamin Franklin's Science" by I. Bernard Cohen. Franklin has been rightfully touted as a statesman and inventor with a treasured place in American History. But too often overlooked is that this self-made printer can also be considered one of America's first Citizen Scientists. By focusing on Franklin's scientific interests this book provides a refreshing peak at his intellectual pursuits. Unfortunately it's still just a peek, but more than is gleaned from other biographies and hopefully inspires future writers to tackle his legacy from this perspective. According to his autobiography, Franklin saw his first electrical experiments in Boston. Here is his first account of this event and its consequences: 'In 1746, being at Boston I met there with a Dr. Spence, who was lately arrived from Scotland, and show'd me some electrical experiments. They were imperfectly perform'd, as he was not very expert; but being on a subject quite new to me, they equally surpris'd and pleas'd me. 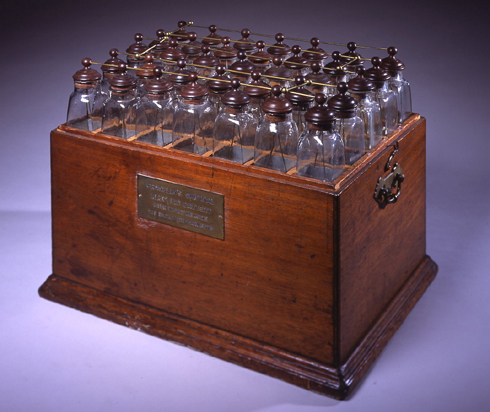 Soon after my return to Philadelphia, our library company received from Mr. P. Collinson, Fellow of the Royal Society of London, a present of a glass tube, with some account of the use of it in making such experiments. I eagerly siezed the opportunity of repeating what I had seen at Boston; and by much practice, acquir'd great readiness in performing those, also, of which we had an account from England, adding a number of new ones." Those who think of Cotton Mather as the typical Puritan bigot may hold it odd that he had any influence on the liberal Franklin. Cotton Mather, however, has been a neglected figure in our history, and his full stature and character are not generally known. One revaluation of Mather has come from the study of his interest in science. It has been shown that he was the author of the first account of spontaneous hybridization in plants. His sponsorship of inoculation against the smallpox in 1721 has become part of the literature on colonial American medicine, and his manuscript treatise on medicine, The Angel of Bethesda, has been subject to scholarly analysis...Loving science implied, in Mather's terms, a respect for nature, a recognition that the empirical evidence of the operations of nature in the external world is in perfect harmony with the principles of revelation and true faith...Franklin, of course, had little sympathy with Cotton Mather's theological outpourings. Yet in Mather's activities in 'that realm of social experience' called by Max Weber 'the Protestant ethic', we may catch a glimpse of Franklin in the making. It seems to me, therefore, that an important reason why Franklin did not at once make public the results of the lightning experiment in June was the fear that no one would take him seriously; he did not want to compromise his reputation. After he had heard of the news from France [duplicating his initial results], he was then willing to publish a brief account of the kite, since he now had independent confirmation of what he had proved by means of this experiment. This theme continues when discussing the culture of Philadelphia and many like-minded people who shared similar interests. For we should not just give Franklin credit for his own discoveries (prodigious as they may be) but also for his role in encouraging his fellow citizens to follow scientific developments and make their own contributions, regardless of background. Franklin's double role in the development of science on the American continent consisted first, of adding to knowledge by his own penetrating research and second, of stimulating others to do research, organizing scattered individual scientific efforts so that they might become more effective, and transmitting scientific information to his countrymen and his fellow scientists abroad. Finally, the book wraps with a discussion of Franklin's interest in astronomy with the Transit of Mercury, and his continuing invention of the Franklin stove. Completely new areas for him and not at all related to the field of electricity, where he'd made his mark and was the most experienced. Proving once again his personal ability to contribute in multiple areas, but inspiring modern readers to contribute as well. Which is what I choose to take from the book, at least until the next author comes along willing to give us the full story of Benjamin Franklin, OpenScientist. Now I'm interested in what you think. Have you read the book and have your own review to offer, or want to share thoughts on the man himself? Then let me know in the comments below.